Myocardial Ischemia happens where there is an insufficient flow of blood in heart muscles. Some symptoms are, the heart is not able to pump oxygenated blood and other vital nutrients to the body efficiently and finally leads to destruction of the heart muscles. Blockage of an artery etc. Globally, prevalence of various heart-related diseases, and growing awareness of the population are the prime growth drivers of global Myocardial Ischemia market. 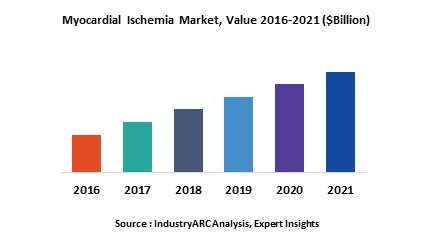 In addition, increase in adoption of Myocardial Ischemia treatments in emerging economies such as China, India and others, will create new opportunities for global Myocardial Ischemia market. However, higher cost of the research and development, and limited healthcare infrastructure are the key restraints for global Myocardial Ischemia market. Geographically North America dominated global Myocardial Ischemia market, followed by Europe. Europe is projected to have fastest growth, owing to increase in the prevalence of various heart-related diseases, and growing awareness of the population about cardiovascular diseases. Asia Pacific is developing rapidly and is considered to be as one of the most promising markets for the augmentation of myocardial ischemia market. The factors which will contribute towards the growth of this market in Asia Pacific are presence of emerging economies, constantly changing lifestyles of people which have accelerated the prevalence of serious heart ailments, and better healthcare infrastructures. This report identifies the global Myocardial Ischemia market size in for the year 2014-2016, and forecast of the same for year 2021. It also highlights the market drivers, restraints, growth indicators, challenges, and other key aspects with respect to global Myocardial Ischemia market. 10.10. Terumo Interventional Systems Inc.